All ambitious Juniors should try and attend senior training to gain experience. If you are good enough, you are old enough. 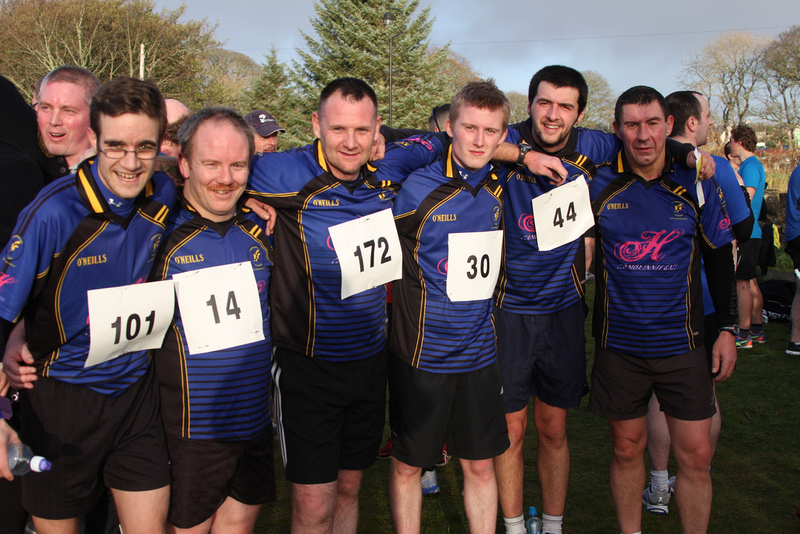 Here’s a wee photo of the six intrepid Leodhasach players, Sean MacLeod, Graham Cay, Duncan MacIntyre, Peter Gomez, Andrew Murray MacDonald and Crawford MacLellan, who ran the Men’s 5K on Saturday 23rd November through the Castle Ground’s in Stornoway – very important that the boys were decked out in the blue and black and they all put in a good shift whilst representing the club. Graham also is sporting his Movember Mo’ and the event was run with the aim of highlighting men’s health issues, but in particular testicular cancer. Very good to see Coinneach out and about again and as always we appreciate his photography skills. Mile taing. It’s been a very busy 24 hours for the Camanchd Leòdhais crew, far and wide! We’ll try and do justice to these events separately later but for now we’ll give you a quick overview. Photos to follow. Firstly, many congratulations to Micheál Macdonald who represented Glasgow/Tayside in the Annual Scottish Universities fixture in Dundee today, Micheál has been a regular for St Andrew’s Uni this year and he enjoyed his call up although Edinburgh/Aberdeen won on penalties after a 4-4 classic. Great to have another player from the club receive representative honours. Youth training continues to be a success inside on Saturday mornings, please send the kids along at 10 to the sport centre. And finally, massive congratulations to Donald Lamont and his new fianceé Emma MacInnes, Donald popped the question in Amsterdam and we are glad to see Dubh is Gorm weddings come thick and fast these days! Emma has been a big supporter of the club and is already a big part of the shinty family. We wish them all te best! The club should be proud, we have good numbers for the Men’s 5K which starts at 1pm this Saturday – however, this obviously means no indoor trainig for the first team squad. What would be appreciated however is a hand with the youth training in the sport centre come 10am Saturday. Circuits is at 7pm Thursday. Ally and Micheal both had contrasting fortunes in Uni Shinty, Ally’s Edinburgh side cruised to a 16-0 win over Dundee whilst Micheal’s St Andrew’s side fell away to an 8-2 defeat to Aberdeen. There is an offer to take part in the Skye Winter 6s on 28th December, the day after the Dinner Dance, who is up for going? Speak to Diablo. 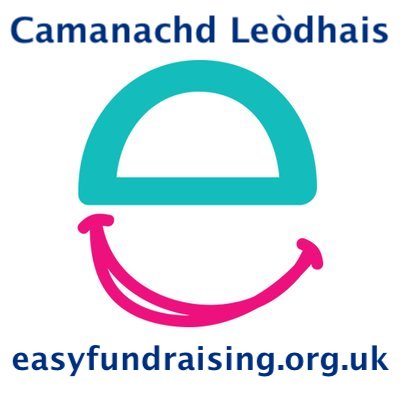 We would really like to have as many Camanachd Leodhais players signed up to do this 5K on Saturday 23 November – Perfect way to really kick off your preseason fitness and also a great way to represent the club for a good cause. All the blurb is below, Diablo has the forms anyway! Calling all men! If you are still thinking about taking part, or have yet to return your registration form for the Men’s 5K being held on Saturday November 23, don’t worry – there’s still plenty of time. However, Registration Forms and entrance fee payment must be returned to the Lewis Sports Centre by no later than Thursday November 21st. With the Western Isles’ first Men’s 5K fast approaching, registrations are continuing to be received from men, teams, and boys aged over 12 – but even more men are needed to help raise awareness of male cancers and raise valuable funds for local male cancer charities in the Western Isles. It’s worth remembering that, through your efforts, all monies raised will go towards providing valuable aid to local men and their families affected by cancer. Registration starts from 12noon on the Stornoway Rugby Pitch, with the event officially starting at 1pm. Changing and showering facilities have been made available for entrants at the All Weather Pitch at Smith Avenue. The route will see entrants, whether walking, jogging or running, start from the Rugby Pitch, head towards Cuddy Point and travel out towards Creed Mouth, onwards to the Iron Well, continuing round past the Gallows Hill junction, down towards Cuddy Point, to finally finish at the Rugby Pitch. Volunteer marshals will also be available throughout the route. As well as individual entrants, organisers also hope to encourage a number of 3-man teams made up of males with a range of ages and fitness levels. An award for the team with the nearest time of 1 hour 30 minutes will be made. Registration forms are available at a variety of local outlets and workplaces, or any Council or NHS Western Isles location, or online at: www.wihb.scot.nhs.uk. Designed to suit everyone’s budget, entrance fees are as follows: Adults (over 18s): £5, Under 18s: £3, and 3-man teams: £10. Those who register may also wish to pick up a Men’s 5K sponsor form, in order to help raise additional funds. Participants and supporters are asked to park their vehicles at the College car park in order to avoid congestion at the Golf Club and surrounding areas. Specially designed black T-shirts featuring the Men’s 5K logo can also be purchased from the Lewis Sports Centre from 18th November, at £8 each. The Men’s 5K design, which features the Lews Castle background with runner crossing the finish line, is hoped to be worn by those taking part, but can also be purchased by those who wish to simply support the event and help to raise additional funds. Following the Men’s 5K, participants will also be offered the opportunity to take part in a cool-down Yoga Session provided free of charge by Carlyoga. Continuing with the Movember theme, free soup and ‘man-wiches’ are also being offered, courtesy of the Lewis & Harris Rangers Supporter Club, to participants directly afterwards, at their branch at 19 Inaclete Road, Stornoway. Later in the evening, the ‘50 Shades of Red’ celebratory evening dance is being held in the Stornoway Golf Club from 10pm, with popular local band ‘Ugly Violet’. All are encouraged to attend (over 18s only), entry £3 – but Men’s 5K entrants and men sporting a specially grown ‘Mo’ will be admitted free of charge. Finally, with the Men’s 5K coinciding with Movember, it is hoped that a large number of entrants will race wearing their own specially grown ‘Mo’. So come on all you coves, guys and dudes – register your entry for the Men’s 5K and help support men and families affected by cancer in the Western Isles. After the committee meeting on Wednesday there are a couple of big dates for the diary, although more info will come in the next few weeks. First is the Annual Christmas Dinner Dance will take place at the Lodge Fortrose 108 on the 27th December 2013. The player awards will be voted for on the night but if you can’t attend you can submit your vote before hand. The Iomain Challainn will be held on the 4th of January this year, other details TBC. 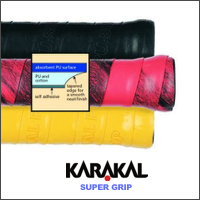 Also it was felt that there was no need to increase membership prices. The membership prices have been frozen once more for the 2014 season. Senior player membership will be £40.00. Non-playing membership will be £20.00. Junior membership will be £15.00. If you have any outstanding fees for 2013 please pay them as soon as possible. The 100 club remains open to entrants. Paddy Sinclair played for Glasgow University as they defeated Aberdeen 3-1 in the University League whilst Micheal Macdonald continues to star for St Andrew’s University. Camanachd Leòdhais received more national recognition at this year’s Marine Harvest Shinty Awards, which were held as always in conjunction with the Marine Harvest Shinty Hurling International Series in Inverness. We were given the One Team Club Fair Play Award for 2013, having the lowest number of bookings throughout the year. The club reviously won this award in 2011 during our debut league season. 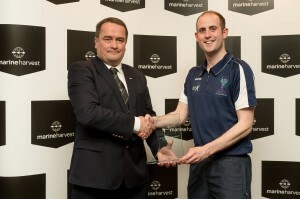 The award was presented by Alan Sutherland of Marine Harvest. Unfortunately, “Diablo” could not attend the awards dinner due to the Isle of Lewis breaking down, so the award was picked up by Eòghan Stewart in his stead. Eòghan was in attendance as he was assistant coach for the National Women’s Shinty Squad, assisting Glenurquhart’s Stuart Reid who helped steer the Scotland Ladies to a 13-11 win over Dublin County Camogie on the Saturday morning. Unfortunately, the senior and u21 men could not add to the achievements of their female counterparts, although both teams made great efforts in trying to overcome the Irish hurlers, the senior men losing 18-14. Kevin Bartlett, formerly Caberfeidh, now Lovat was the standout for Scotland with 12 points of the Scots’ total. If we could please find him a Leodhasach girlfriend that would be great! You can find lots of shinty photos at http://www.neilgpaterson.com.